Fall is here and my mind turns to the angels. As the leaves drop and remind us of our earthly transience, our thoughts settle on the spiritual world which is usually hidden from our senses, the world of Heaven, in which dwell the saints and angels. And so, we celebrate the feasts of the Archangels Michael, Gabriel and Raphael on September 29, followed soon after by the feast of the Holy Guardian Angels on October 2nd. I try to focus on deepening my relationship with my guardian angel each October. I invite you to join me in this and, in the process, we can help our children to do so as well. 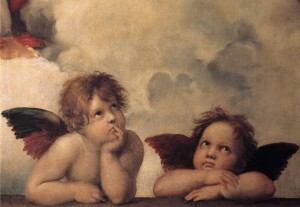 Children love the angels: the beauty, the imagery, the mystery, the safety and protection. Honestly, we don’t know and understand a lot about the angels who lead an existence so different from us. But, let us ensure that our children know and understand the truth about who the angels are and what they do, so they are not misinformed by the popular culture. Guardian angels are chosen for us by God Himself and remain with us constantly. They are powerful enough to protect us from all spiritual and physical harm, although God may allow us to experience some harm or temptations caused by the evil of this world for His glory and our ultimate spiritual good. Angels are NOT deceased human beings. We can have relationships with our deceased loved ones who are SAINTS in Heaven. They continue to love us, pray for us, and even help us. Saints have been known to appear to us, but that does not make them ANGELS. An angel is created as an angel. When people refer to deceased humans as angels, they really mean that they are LIKE the angels now in the sense that they live as spirits with God in Heaven. Angels are pure spirit. They have no body. When angels appear to human beings they appear in ways that serve the purpose for which they are sent, often in human form. Physical depictions of angels in art are usually meant to be symbolic. Wings indicate speed as angels are not limited by time and space and so they appear to move very quickly. It also depicts that they have come to us from Heaven, high above. Scripture often describes the angels as being bright or white, referring to the power and purity of Heaven. Angels do not sin. Angels don’t live in time and space as we do. Their life is not a process. They see good and evil clearly and choose or reject God outright. Angels choose good. The ones who reject God are devils. Angels live in Heaven with God but can also be present to us when God commands. Angels will never sway from God’s will, but when we pray to them for help, God will answer our faithful prayers. God is very generous to us. He allows us to help the angels protect and guide us. All we have to do is ask and listen. Angels are much more powerful, smart, and beautiful than we are. They are innately greater beings than we. But in God’s wisdom, by becoming one of us through the Incarnation, He has made us greater than these superior beings and through the Coronation of Mary has made a human being Queen of the Angels. Once again, the last shall be first in the Kingdom of Heaven. Angels do not experience gender the way we do. They do not fall in love and marry the way we do. When Jesus explained that there is no marriage in Heaven, he explained that we would be “like the angels”. It is of interest that the angels described in Scripture are all male in nature. Angels are people. They are individual creatures of God with a mind and a will. They love us and want to be our friends in the Communion of Saints. What can you do to increase your family’s devotion to the angels? Reach out to the angels in your prayers. Pray the Guardian Angel prayer and Prayer to St. Michael with your children daily. Pray to your angel and to their angels, regularly. When you are struggling with your child, ask your Guardian Angel to work with his Guardian Angel. Pope Pius XI recommended this strategy when dealing with others. Be open to the knowledge and possibility that angels interact with our world in supernatural and miraculous ways. Encourage everyone to name their Guardian Angel and depict them in art. Pray before choosing a name and look it up to see its meaning. I prayed a great deal before choosing the name Olivia for my guarding angel, which I then discovered means “peace”. At the time, I was greatly in need of peace in my life. I continue to address my angel as “Olivia”. This helps me remember that this angel is a real person who really loves and cares for me. Keep images and books about the angels around the house. When our boys earned their Tae Kwon Do belts, we gave them Christmas presents of belt displays with an icon of St. Michael to accompany the display. Additionally, there is good Science Fiction/Fantasy with great angel characters. L’Engle’s Wrinkle in Time Series, CS Lewis’ Space Trilogy, and Tolkien’s Silmarillion are some classic examples. What are your favorite angel resources? I’ve heard before that naming your guardian angel is strongly discouraged, if not actually forbidden. But a friend of mine once shared a way to find out your angel’s real name. Is that allowed? What you do is, just before you fall asleep, pray to your angel to tell you his name. Then, when you wake up, the first name you hear in your heart is the name of your guardian angel (mine’s is Alexander). Since I can’t even remotely conceive of how knowing your guardian angel’s real name could be harmful, I have continued to call him Alexander. It reminds me that he is real and is really listening. It makes the relationship more personal and even fun – as in, hey, Alexander, can you watch my car for me while I go into the store? Everything that we can do to make our faith down-to-earth, I think, is good.